Fat tail geckos are common in captivity, although are not bred as efficiently as the leopard gecko. 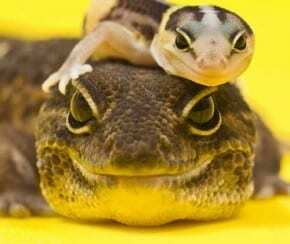 They are slightly harder to breed and are slower growing than leopard geckos. They are however, wonderful lizards and make excellent pets. For a single or pair of fat tail geckos, a vivarium 60cm Length x 30cm Width x 30cm Height will be ample room. If you would like a trio (1 male and 2 females), than a 90cm vivarium would be required with additional hiding places. A vivarium can be made from a number of materials; wooden with melamine coating, glass, plastic and even good quality metal enclosures have been made. I suggest a wooden vivarium, which is coated with melamine to allow the enclosure to last much longer. If you use regular chipboard or other non-coated woods, the vivarium will not last long with the water spillage and waste products related to keeping any animal. Be sure to have plenty of ventilation holes. Many vivariums are available on the market today already made to suit most reptiles, with ventilation holes and even fittings for the various heat and light appliances. Fat Tail Geckos come from hot and humid areas which should be re-created in a captive environment. Unlike the leopard gecko, they should be provided with a slightly more humid environment. Soil is an ideal substrate, as it holds the moisture without being wet and allows for natural burrowing to occur. If substrates such as newspaper and dry wood chips are used, it is essential to provide a moist box. For a naturalistic environment, rocks, wood and plants can all be used. Although some live plants are safe to use, I suggest fake plants. Live plants will require more care and many give off toxic fumes. Be careful when placing heavier objects into the enclosure. Fat Tail geckos like to burrow, and will not hesitate to try and burrow underneath a rock. Make sure these objects are placed directly on the bottom of the enclosure and not on top of the sand, as this will collapse if the gecko decides to burrow under. If you use any objects which have been outside, wash them thoroughly with hot water and weak disinfectant. It is important to be as clinical as possible and reduce any risk of bringing in infectious diseases or parasites. Like all reptiles, Fat Tail Geckos require a thermal gradient, meaning they must be allowed to move around the enclosure to find their required temperature. The hot end of the enclosure should be 86-90ºF while the cool end should be approximately 74-78ºF. During the night, the temperature should drop to a more constant overall temperature of 74-78ºF. In my opinion, the ideal way of heating a Fat Tail Gecko enclosure is to use a Ceramic Heater. The WhitePython™ Ultra Slim Ceramic Heaters are the ideal choice as it gives off ample heat but equally doesn’t take up too much space in your terrarium. Ceramic heaters do not give off light and therefore in a terrarium you will need a form of lighting as well. To regulate the temperature accurately you should use a suitable thermostat. Power Plates, spot bulbs and heat mats are also ways of heating a terrarium. These all have their advantages and disadvantages, but in my opinion, none quite weigh out to be as good as ceramic heaters. Fat Tail Geckos are primarily nocturnal, meaning they venture out in the dark of night. This is when their main predators are sleeping, and their prey is awake. This is not to say though, that they never see the sun, or any form of lighting for that matter. They will often bask in the sun during the day in the wild, so lighting should be offered. Having artificial light in a terrarium is aesthetically pleasing to the owner, and is a good addition to a snake’s enclosure. They will use this as a photo-period, and their regular time clock will generally adjust to the settings on which you have your light set to. They do not require any form of special lighting, such as a D3 Ultra-Violet light commonly used for diurnal species. The WhitePython™ range of LED lights are a great way to light your enclosure whilst using minimal electricity. They are also very slim and therefore do not obstruct your view into the terrarium. What’s more, they are available in virtually any length you require. If you would like a go a step further and see your snake’s activity during the night, you could use the Moonlight Blue or Nighttime Red versions of the LED lights. It is important that water is available at all times. Fat Tail Geckos are native to West Africa where the humidity is high. They will often drink from water droplets on logs and plants, but will also drink from standing water regularly. A shallow water dish which is hard to tip over and easy to clean is ideal. It is also an idea to have a bowl which does not have small crevices and cracks in it, which mould can build up in, and small insects can hide in. Fat tail geckos are primarily insectivorous, feeding on insects. However will sometimes feed on small pinky mice and perhaps even eat small amounts of tinned pet food. Mealworms, wax worms, earthworms, crickets and locusts are all suitable prey items. However certain foods should be limited. It is important that the food you give your gecko is as highly nutritious as possible. It would be nearly pointless to feed a starved cricket to your gecko. Therefore, placing food such as potato peel and cabbage into the insect’s enclosure will benefit the gecko as much as the insects. Gut-Load can also be bought from many retailers. This is a balanced food for insects and should be offered to the insects at least 12 hours before feeding. Hatchling or juvenile fat tail geckos should be fed on a daily basis. They will eat up to around 8 small crickets or similar insects. These insects should be either crickets or locusts, and should be no larger than the width of the gecko’s mouth. Wax worms can be offered in small quantities once a week, and mealworms can also be offered in small quantities twice a week. A Calcium:Phosphorous supplement should be dusted onto the food every other day. This is to aid in growing a healthy, strong bone structure, particularly in the leg and jaw areas. MediVet Repton, 2:1 Calcium:Phosphorous is a good product to use. Adults can be fed less regularly, 2 or 3 times a week. They should eat around 8 insects at a time, but obviously these should be larger insects, approximately the size of the gecko head. It is important the food is not too small for the gecko not to be interested, and also important for it not to be too big for it to become hard to swallow. For females in breeding season, calcium supplements should be added to food on every feeding, to aid in the development of the eggs. For males and females out of breeding season, a dusting of supplements once a week will suffice. Pinky mice should also be offered to breeding females every week, this will help build up fat reserves quickly after the laying of her eggs. They can also be dipped in calcium dust to help maintain healthy eggs.